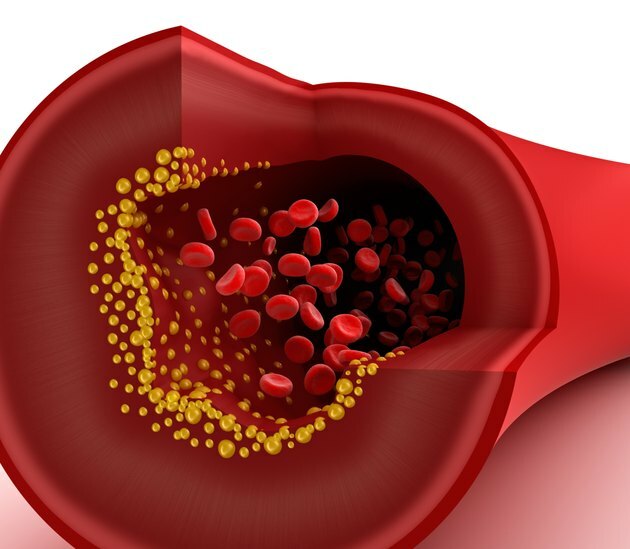 Can You Have Blocked Arteries With Low Cholesterol? Blocked or clogged arteries typically occur when a substance called plaque builds up on your artery walls and significantly reduces your normal blood flow. High cholesterol is a major risk factor for plaque buildup. However, a number of other factors also contribute to the process, and you can develop blocked arteries even if you have low cholesterol levels. All plaque contains some cholesterol, as well as fat, calcium and various other materials in your blood. When plaque builds up on your artery walls, it triggers an artery-hardening process called atherosclerosis. In turn, the reduced blood flow associated with atherosclerosis can lead to a serious medical condition called coronary heart disease, which is characterized by reductions in the amount of oxygen received by your heart muscle. Partially blocked arteries can become completely blocked when an area of plaque breaks open and triggers the formation of a blood clot in a narrowed arterial passageway. Both partial and complete blockages in a coronary artery can lead to the onset of a heart attack. Anything that damages the inner layers of your coronary arteries can lead to plaque buildup, artery blockage and heart disease, according to the National Heart Lung and Blood Institute, or NHLBI. Apart from high cholesterol levels, known major risk factors for this type of damage include high blood pressure, abnormal resistance to the effects of a hormone called insulin, smoking, lack of exercise or physical activity, diabetes, smoking, advancing age, being overweight or obese and consumption of an unhealthy diet. Another major risk factor, called metabolic syndrome, arises when you simultaneously have several other heart disease risks. Some people also have a genetic predisposition toward coronary heart disease that creates a major risk apart from any additional factors. Men typically have higher heart disease risks than women. Certain other factors may also increase your coronary heart disease risks, the NHLBI reports. They include heavy alcohol consumption, stress, the presence of a condition called sleep apnea, high blood levels of a fatty substance called triglycerides and the presence of a pregnancy-related condition called preeclampsia. You may also have an increased risk for atherosclerosis in your coronary arteries if you have a history of artery-related problems such as an aortic aneurysm or a stroke. If you have non-cholesterol-related risks for blocked arteries and heart disease, your doctor may recommend a variety of medications to lower your blood pressure, relax your arteries, improve the blood flow to your heart or reduce your heart's workload. Potential options to achieve one or more of these results include beta-blockers, ACE inhibitors, aspirin, clopidogrel, prasugrel, diuretics, calcium channel blockers, nitroglycerin or other nitrates. If you have cholesterol-related risks, your doctor may prescribe a drug from a class of medications called statins. Consult your doctor to learn more about your risks for blocked arteries and coronary heart disease. How Does Exercise Increase Sympathetic Nervous System Activity?